Included in the scary lofty goals I set for 2019, I have a stack of books I want to read. Everyone has a stack of books on their bedside table, right? I’m excited to dig into these books and spend less time mindlessly watching videos online. Here’s what’s on my reading list, in no particular order. Note: These are all affiliate links. If you click on a link and purchase any of these books, you’ll pay the same as everyone else, but I’ll get a small commission. As the godfather of content marketing, when Joe Pulizzi speaks, I shut up and listen. I’ve had the pleasure of seeing him speak since joining the Content Marketing World family in 2015. I come away from each of his talks with pages of ideas and actionable steps to apply to my content. After devouring Killing Marketing earlier this year, I’m excited to read this book. 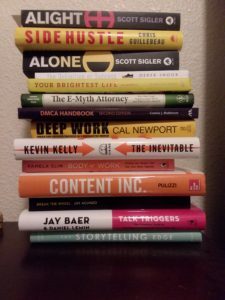 I started following Jay Acunzo’s podcast, Unthinkable, after seeing him speak at Content Marketing World. I spent many mornings running with his interviews with non-traditional entrepreneurs in my ears. He highlights people who found success by ignoring “best practices” and doing what made sense for them. I believe my intuition is never wrong (though sometimes inaccurate), and I look forward to reading about other entrepreneurs who follow their gut instincts. I heard about this book at Content Marketing World this year. Derek Snook voluntary became one of the people he was trying to help in order to learn how to best provide for their actual needs, rather than speculate what their needs are as an outsider looking in. Additionally, I’m drawn to the belief that the definition of “success” is personal. As a minimalist, I know my definition of success has nothing to do with the car I drive or what jewelry I wear. I was impressed by Joe Lazauskas’ talk on storytelling at the Intelligent Content Conference this year. I hope this book will help me engage and connect with my audience by telling more powerful stories related to my work. I loved Jay Baer’s talk on talk triggers at Content Marketing World this year. These are things that companies do to get people to talk about them – like the chocolate chip cookie you get when you check into the Doubletree Hilton hotel or how everything at Content Marketing World is orange. 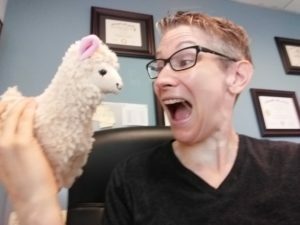 Jay’s book has llamas on the front and he sent it to me with stuffed llama toy. I’m curious to read the book and learn about the connection. I like Chris Guillebeau because he seems like a quiet guy in person, but beneath that calm exterior, he’s dripping with grit and determination. I started reading this book a few months ago and it lays out what you can do day-by-day to bring an idea to market in under a month. Reading his work helps me not get bogged down in the minutiae of creating a “perfect” product but rather focus on bringing the minimum viable product to market and revise based on actual customer feedback. Earlier this year, I bought Jason and Caroline Zook’s future. I paid a flat fee and every time they come out with a new product or service, I automatically get it. I’ve used Jason’s products in the past, and it made sense to make this investment. This is my first Caroline-create product and I’m excited to see her thoughts. I think I might be like her – someone who was hesitant to get into the product-creation business, but willing to try because she had something of value to offer. I picked up these two books at an invite-only event for lawyers called TBD Law that was only open to forward thinking practitioners. Other attendees spoke well of both books. I’m all for more focused work and success, especially with everything I have on my plate. Connie Mableson is a lawyer and a colleague who works in my building. She knows the DMCA forwards and backwards, and I’m always looking for resources that will make me a better practitioner and help my client be more effective in protecting their intellectual property. I read the general E-Myth book early in my experience as an entrepreneur and I was enormously helpful. It helped me think about creating systems and a master document for how my business should be run. I hope this book gives me suggestions about how to be a more effective business owner. These are the second and third books in the Generations Trilogy Series. I’ve already read the first book, Alive. I rarely read fiction because my brain knows it’s not real, so it doesn’t easily remember the storyline. Scott Sigler is one of the few writers who captivates my attention. If you like sci-fi, I highly recommend him. I’ll be reading Alone along with the audio version of the book that he put out via his podcast. I devoured this book in three days while Rosie and I were on vacation this year. The pages are filled with underlined passages and notes in the margins. I came away from it teeming with ideas for creating more blog content. I’ll definitely be going back to review my notes. I’m interested in doing more research and speaking about integrity. As a lawyer, I know there’s a huge difference between what someone can do and what they should do. So many issues (legal and otherwise) would be prevented if people merely did the right thing. I know this book has many examples of companies doing the right thing by their customers, at least after a substantial misstep.